Closure can open new doors, even as one door is closing for good. There are so many other doors we can’t even imagine. Doors that may be right in front of us but we can’t see until we accept that the old door will never open again. Sometimes just apologizing to someone can lighten your emotional load and bring closure to an uncertain or painful situation. I had been struggling with severe guilt and shame over some things I said to someone whose views I respect. I never had ill intentions or alternative motives but this individual reacted in (what I thought was) an extreme way to my obliviousness and insensitivity. While this individual has still chosen to no longer be friends, I respect their views about that and I think that decision is for the best. For my part, I just feel so much better now that I apologized and had the opportunity to thank them for their friendship when it was needed. It’s no longer necessary, and because I reached out in sincerity and humility, I feel like I can finally move on. I feel so much lighter and freer than I did before I reached out. There has been closure, and that’s always a good thing. This entry was posted in apologies, closure, ending a friendship, friendship, gratitude, moving on and tagged apologies, closure, ending a friendship, friendship, gratitude, moving on by luckyotter. Bookmark the permalink. 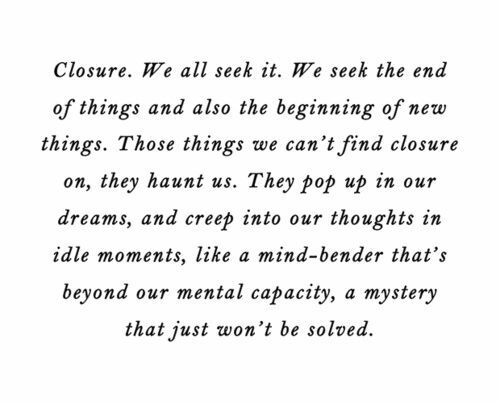 Closure is indeed a good thing. More importantly it is a positive sign of your progressing mental health, that you can see and acknowledge mistakes that you have made. I think a common misconception (thank you legal system) is that having mental health issues excuses behavior, it doesn’t. It only explains the behavior. I think one of the tougher aspect of positive mental health is addressing past regressions, owning up to them and then accepting the consequences of your actions. So it is a sign of maturity on your part to be able to do this! Kudos to you!